Janet Arnold’s illustration of the interior of a woman’s dress, circa 1896. From Patterns of Fashion 2. Notice the belt, attached only at the center back seam. … even when you have primary source information, like this photograph. Fashion Photograph from 1896. Met Museum. We can see from the photo that the skirt at left is probably flat-lined — those tell-tale wrinkles would have been omitted in a drawing. It’s better than a drawing, but the answer to “how did they do that?” requires inside information. Cream brocade gown from the House of Worth, 1896. Collection of the Metropolitan Museum. Detail of Worth gown from 1896, showing several rows of cartridge pleating on the sleeve and lace-shaped beading on the brocade bodice. Met Museum. But to reproduce a vintage garment and have it “behave” properly, we need to know where the seams (and the bones) are, how the garment was lined, where the hidden closures were located, what made those sleeves stand up like that***, etc. Also, sometimes we discover a “trick” that made the garment easier to put on, or made it fit better. For costume purposes, we don’t need to follow the original slavishly (sometimes all those difficult hidden closures are not practical for a costume,) but we can make informed decisions. One device that I have seen on vintage garments — and used on costumes — is the interior waistband or belt. This turn-of-the-century vintage bodice had one. Inside, a belt (never meant to be seen) was attached to the seams at center back. It closed at center front, and would be the first thing the wearer fastened when getting dressed. Interior belt or waistband on a Turn of Century [ToC] bodice. As Janet Arnold sketched the insides and outsides of museum garments, she drew many bodices that used an interior belt. Interior waistband or belt, drawn by Janet Arnold. Notice that the belt is only secured to the center back seams, with characteristic X stitches. It closes with hooks and bars at center front. It anchors the bodice to the wearer’s waist, so the bodice cannot ride up. It also holds the bodice in place while the many concealed hooks, eyes, and tapes are fastened. It takes some of the strain at the tightest spot, so the wearer doesn’t have to exert much pull on the more delicate fabrics to fasten them. The interior belt works well on corsets. I have seen and used these belts on the inside of corsets — what a great difference they make! When you lace your own corset after fastening the front busk, you can’t be sure of getting it the same size every time. (Corsets rarely meet in the back.) Delineator, April 1914. First, the interior belt closing gives a constant size for the corset. You can’t accidentally lace it looser by mistake. If your dresses have been made to fit perfectly over your corset, but the corset lacing never actually meets at the waist, there’s always a chance that you will tighten your laces, put on your dress, and find that the dress doesn’t fit properly, because you pulled the laces too tight — or allowed yourself a bit more room than you did at the dress fitting. Secondly, when there is a waist belt inside your corset, the belt contracts your waist to the right size for fastening the front busk. The belt takes the strain (and keeps your corset from falling to the floor), giving you two hands free to hook the busk at the waist. Once the corset is fastened there, hooking it the rest of the way up and down is relatively easy. You may not need to deal with the laces at all. The interior belt is can be made of a non-stretchable ribbon, like grosgrain. The belt is also a great help in supporting the weight of the skirt; in many period dresses most of the skirt fullness is at the back, so the skirt of the dress can be quite heavy, and hard to wrestle with when its weight pulls the bodice crooked as you try to deal with dozens of fastenings. 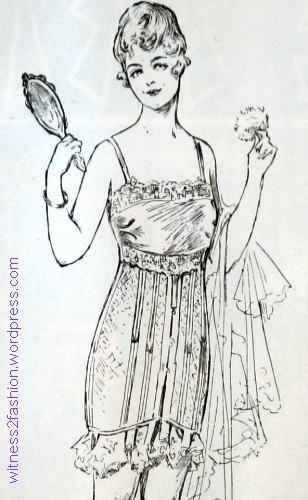 Detail of Arnold’s drawing of the dress from 1913-14; no closures are visible, as the built-in sash hides the places where the skirt is only hooked to the bodice. The skirt is fur-trimmed. The use of an interior belt is not restricted to the Victorian era. It remains part of the interior structure on couture when needed. It might be used, for example, to prevent tight jackets’ buttons straining against buttonholes at the waist, or to prevent too much strain on a zipper. I can’t swear this famous Christian Dior New Look suit’s interior structure uses a belt, specifically, but something is preventing “pull” on the buttons. Click here for a great essay on “New Look” construction techniques. This Dior dress from 1955 is lying open on a table, positioned so you can see one end of the interior waistband; it matches the gray of the dress, which is flat-lined with gray organza. At the place where the dress fits most tightly, the strain is taken by the belt rather than the zipper, which is visible to the right of the belt. Christian Dior label, “Automne-Hiver 1955.” Charcoal gray dress with matching bolero jacket. Photographed from a private collection. The owner mentioned that this dress was made during Dior’s lifetime. You can see the unusual seam lines and darts on the jacket, which also has an interesting vertical buttonhole treatment. Bolero jacket from Christian Dior, 1955. The matching dress has a full skirt pleated at the waist. With the bolero jacket unbuttoned, the use of a separate panel to create “buttonholes” can be seen. Inside view of Dior buttonhole in the bolero from 1955. The seams on the front of the jacket are not the same as those on the inside, and the buttonhole is reinforced like this. Here, the interesting seams of the cap sleeve are visible. The back of the dress, with zipper, is visible at right. Back to the topic of researching the insides of clothes you need to re-create, and the interior belt…. Arnold studied this dress from 1915-16 inside and out. If you were planning to copy it, you might think the outside tells the whole story — bodice and skirt both gathered at the waist. A circa 1915 dress in a museum collection, drawn and its construction analyzed by Janet Arnold. Note the way a series of tiny tucks curves the sleeve forward. 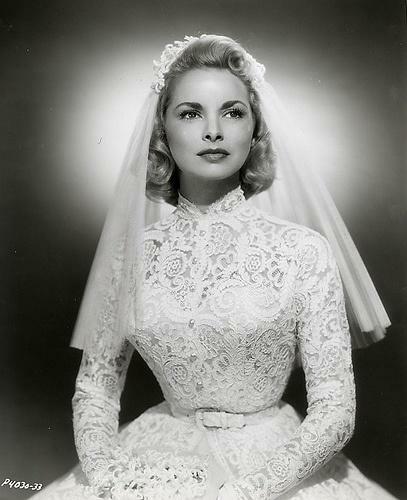 Text describing the dress mentions that is would have been worn over a corset like this one. The interior, drawn by Janet Arnold, shows that the scalloped dress in not as simple as it looks. It has an under bodice, a hidden closure in front, a skirt that is partially attached to the bodice and partially hung from hooks and bars, and an interior belt that is boned and tightly fitted. Like many vintage dresses which are bloused, this one has an under bodice. See French Linings. The bodice itself has kimono sleeves without armhole seams. Petersham ribbon looks much like grosgrain, but grosgrain cannot be stretched with steam and pressure. Petersham is often used in hat bands because it can be shaped into a slight curve with a steam iron. I cannot praise Arnold’s Pattern of Fashion books too highly. Even if you choose not to duplicate her scaled patterns exactly, you will gain insight into period (and couture) construction that is invaluable.